The current fascination with all things visual would seem to imply that embedded BI is primarily concerned with attractive dashboards and ad-hoc querying. For a few users it might be. Senior management certainly want to see dashboards with KPIs, but front-line workers have job to do and cannot afford to spend excessive time exploring data. So the need for facts and figures that are embedded into production applications is considerable – and always has been. While most of the suppliers shown below support dashboards and data exploration, in reality the resulting embedded intelligence is often shown as tables and maybe a few charts. It’s the same with big data. Most suppliers support big data to varying degrees, but in most businesses it’s the data held in transactional databases that are of most interest. Needs, levels of sophistication and skills vary considerably. The list below is fairly eclectic, from established embedded BI platforms such as Birt, JReport, and Jaspersoft, through to newer entrants such as Yellowfin, Chartio and Sisense. There is probably something here for everyone. Embedded BI is the new thing. It is fairly apparent that having to switch between production applications and BI tools is unproductive. And so the race is on to provide adequate mechanisms to embed BI into the business applications which are used day in and day out. So we can expect new players to enter this space. For most people BI belongs in the apps they use, and not in some stand-alone environment. Embedded BI will be big. Birst comes as a cloud deployment or an appliance. Data access, manipulation and storage features strongly with sophisticated ETL, a multi-dimensional data warehouse, managed data mashups and relational OLAP. The BI interface supports all modes of reporting and visualisation from interactive self-service dashboards to visual discovery to pixel-perfect reports. Birst combines ad hoc analysis of data and banded report writing into a single user interface. Any report built in the Birst business intelligence platform can be exposed in a dashboard. The OEM market is targeted by Birst with tailored training and flexible business terms. Birt from Actuate (now owned by OpenText) is an established platform for embedded BI applications. iHUB is the web based embedded BI platform and data management system that provides reporting and data visualisation capability. The latest version comes with a REST API and template-based embedding of visualisations. Birt provides three deployment options – The Standalone BIRT Designer Option, Embedding Eclipse BIRT Runtime Engine and Java APIs, and Deploying with BIRT iHub. – depending on need. Differentiators: Cloud BI for embedding of visuals and ad-hoc queries. Chartio one of a newer generation of cloud based Bi platforms and majors on dashboards and ad-hoc queries. This is not really a production reporting environment, but embedding is given emphasis by Chartio and is more applicable to embedding in on-premises applications. Mobile devices are supported via the HTML5 and SVG interface, and a variety of information distribution methods are supported. These include the scheduling of distribution through email, and dashboards can be delivered as PDF attachments. Jaspersoft, now a TIBCO company, has open source roots and is widely used for embedded BI applications. The platform supports a wide variety of BI formats and activities including dashboards, data exploration, interactive reports, OLAP analysis, and good support for mobile devices. Jaspersoft is based on REST and SOAP web services, supports standard identity management systems, provides built-in multi-tenancy support, and has a HTML5/CSS driven user interface for easy re-branding. The interactive reporting provides on-the-fly sorting, filtering and formatting. Big data connectivity provides direct connection to Hadoop, MongoDB, Cassandra and other big data databases. A multi-tenant capability isolates users, in SaaS based environments particularly. Differentiators: Very experienced – technology embedded into some very large applications. JReport is used by some of the world’s largest businesses such as Visa, IBM, and Target, typically to provide online reporting facilities to customers, but is also used in many businesses to provide information directly to employees and partners. At the current time, around two thirds of Jinfonet’s business comes from OEM, ISVs and other third parties who provide embedded intelligence in a variety of services and products. JReport supports dashboards, charts, data analysis, reporting, and connects to a wide variety of data sources, including big data, relational databases and cloud based data. Differentiators: Experienced supplier with open architecture. The Logi platform is designed for easy web deployment on .NET and Java application platforms. Applications can be deployed to any major infrastructure, whether on premise with end users, hosted at a data center, or in a cloud-based infrastructure such as Amazon Web Services or Microsoft Azure. Most Logi Analytics customers are primarily interested in embedded BI, and over 600 commercial software and SaaS providers use the technology. Differentiators: Established embedded BI platform with flexible deployment options. Pentaho (to be acquired by Hitachi Data Systems) comes with an extensible architecture, which is well appreciated by many ISVs and other third party developers. Data access is a strong point with support for big data and many traditional data sources. Dashboards, interactive reports, and ad-hoc analysis can all be embedded in applications, and strong security options and multi-tenancy make it ideal for SaaS use. The platform is built on Java and uses RESTful web service interfaces. Four scenarios are supported – bundled, where Pentaho is a separate app; mashup where Pentaho is inside the existing UI; extended where custom data sources and visualisations are used; and unified with total integration with the app server. Differentiator: Qlik enables developers to access the full power of the QIX indexing engine and chart library, all within a common governed framework. The Qlik Analytics Platform is designed for application developers to easily and with great flexibility embed Qlik’s visual analytics capabilities into their own applications. The Qlik Analytics Platform has been designed to accommodate the need for embedded analytics, and this is done by directly accessing the associative in-memory engine (the QIX Engine) through a series of open and standard APIs such as the Mashup API, Extensions API, Engine API, and back-end management APIs. It enables OEM partners to take full advantage of the QIX associative engine and visualisations to easily build visual analytics capabilities into their solutions. It is optimized to incorporate open source technologies like D3 to create custom visualizations and extensions, and easily allows analytics to be embedded into any workflow or business process application, permitting the extension of visual analytics into partner portals and customer websites. Differentiators: Very fast architecture and strong on data management. Sisense majors on performance, and a columnar database is employed to provide speed and data joining functionality. A whole raft of hardware and system software tricks are used to deliver high levels of performance – the bottom line being the ability to see a unified picture of data. ETL and data preparation also features strongly providing a foundation for the rich visuals – dashboards and interactive reports. Other features include multi-tenancy support, web or Windows client interface and extensive security – database, user and row-level, including filtering by URL parameters. Sisense is a newer player in this market, but is already winning OEM customers. Differentiators: Solid embedded BI platform with high levels of productivity. Differentiators: Attractive and easy to use interface and cloud or on-premises deployment. Yellowfin provides a particularly easy to use BI environment, and its more recent appearance is reflected in the powerful and attractive visuals. 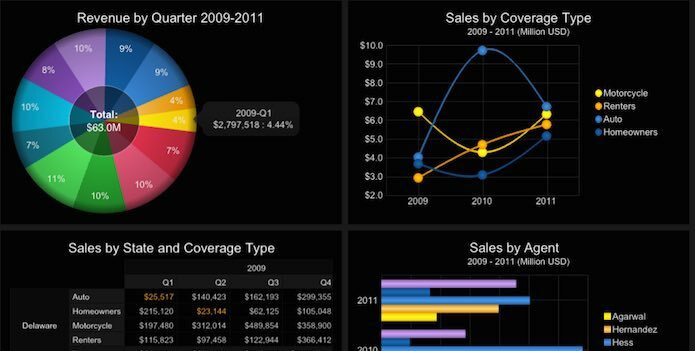 And in fact this is the major theme – attractive charts and dashboards. For OEMs it provides a multi-tenant architecture, white labelling, and solid security. This latter enables integration with any external authentication and role-based authorisation mechanism – such as LDAP, Active Directory or custom security APIs.